Well wishes at Easter. First, thank you, to all who emailed, facebooked, texted or called to see if we were all right. Yes, we are fine. We are soggy, but fine. Many did not fare as well due to the Good Friday tornadoes in our area. So please keep them in your thoughts and prayers as they try to rebuild their homes, business and lives after some devastating storms. 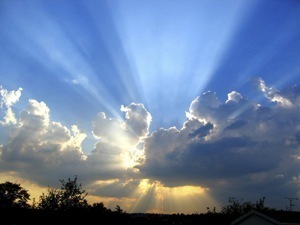 In the face of distress, Easter arrives with its tidings of joy and renewal. We will take it. I hope you and those you hold dear are rejoicing in Easter blessings. 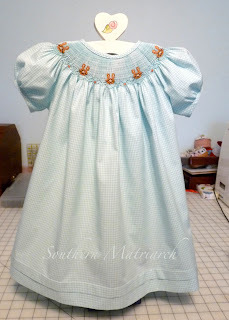 As promised, here are pictures of princess' Easter dress. Nothing fancy. A simple cute little bishop. I had planned an additional dressy dress, but that didn't happen. There is just too much going on around here. It is Children's Corner bishop pattern made with an aqua gingham from Bessie Mary. Smocked with "Somebunny Loves Me" from Creative Needle January/February 2008 I believe. It has been a while since I have done any picture smocking. 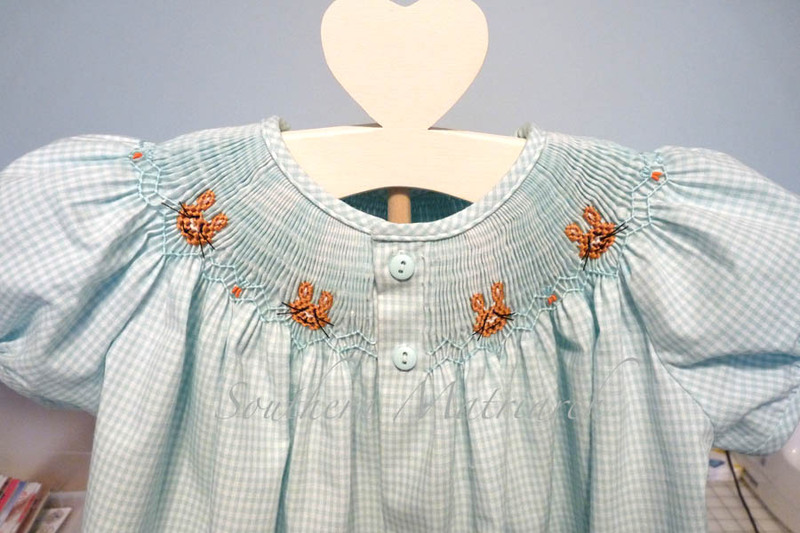 My skill is a bit rusty, but the results are cute bunny faces peeking out across the yoke. The buttons are not really the right size. Don't anyone tell Cindy Foose that I neglected to obtain the correct sized buttons before I started. They were the only ones that were the right color when I went to finish the dress last week. I piped the neckline as usual. I doubt I will ever do a bias binding without piping again. It is so much easier than without the piping. Believe me. Best of all is seeing it on our precious model. 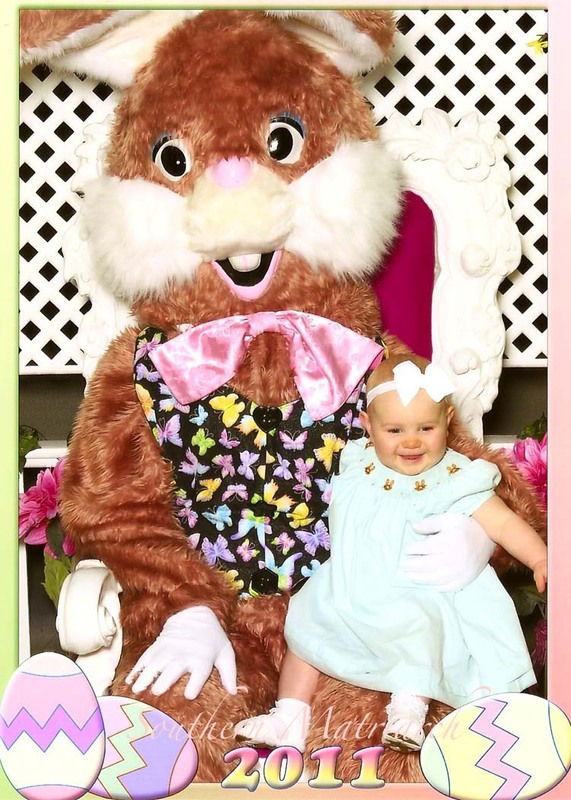 Is that Easter Bunny large and in charge or what? She is busy looking at her mommy instead of the camera but as you see, she is unfazed by the large, scary rabbit with a bad fashion sense. She knows it is all about her. Rejoice in Easter faithful reader, life is good. 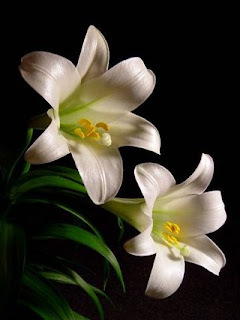 Easter blessings and joy to you and your family, dear friend! Love the bishop and precious model, but that bunny really is in need of some fashion direction! Cute bishop even cuter on Evamarie. Happy Easter my friend !! Beautiful dress but the model is even better! Happy Easter! Glad you made it through the storms. Ooooh! I am lov'in that fabric - I can almost imagine how dreamy it must feel! Glad you survived the storms! Easter Blessings to you! 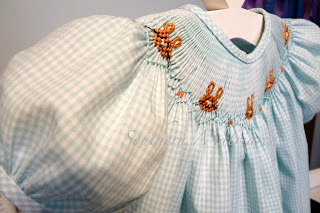 I love smocked gingham! Too cute! 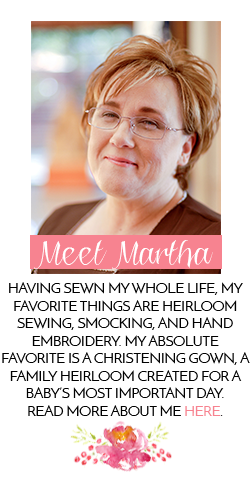 Hello Martha. Your Easter Bishop is lovely. For well over a year I have followed your blog from the sidelines & have learned so much from you. Thanks for that. You mentioned that you always use piping with a bias binding. May I ask if you attach the piping to the garment first or to the bias. I have a hard time keeping bias from puckering a bit and wonder if this trick of yours could help. I too would like to know about the piping with bias bindings. Do have a source where I could read about this technique? The dress is beautiful! Jill, thank you. I will do a tutorial in the next few days on the piped bias binding. I thought I had until I went looking for it to refer you to. Stand-by. Thank You! I'll check back.